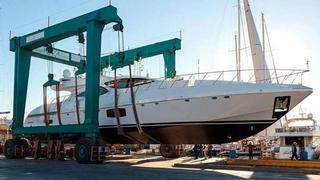 Italian superyacht builder Overmarine Group has announced the launch of its first Mangusta 110 superyacht. The new 33.8m open maxi yacht Mangusta 110 was launched in a ceremony yesterday at the Overmarine Group's private wharf in Viareggio, Italy. She will soon cross the Atlantic bound for the US and will make her world premiere at the Miami International Boat Show in February 2014. The new Mangusta 110 superyacht comes in at the middle of the Mangusta open maxi yacht fleet, just under its 130, which has evolved into the Mangusta 132. Overmarine revealed its new Mangusta 132 superyacht earlier this year in August 2013. The Mangusta 110 superyacht is designed by Italian yacht designer Stefano Righini in collaboration with the Overmarine Group's in-house team. The yacht boasts a racy profile to match her high-performance, sporty styling. Powered by twin MTU 16V 2000M94 engines and Kamewa waterjets, she will easily reach a speed of 33 knots while ensuring high stability, low vibration and low noise levels. The Mangusta 110 also features zero speed gyroscopic stabilisers for comfort at anchor and underway. The new Mangusta 110 boasts a spacious flybridge, which can hosta an optional second helm station. The interior layout has been carefully considered to provide well-considered accommodation volumes and maximum comfort. The standard layout allows for four cabins accommodating up to nine guests. Overmarine offers semi-customisable interior options, allowing for other layout choices and interior styles. Showings its diverse offerings and straying away from open maxi yachts, Overmarine debuted its new Mangusta Oceano 42m displacement superyacht in Monaco.